Powerful arms. Maximum wrist strength. The ultimate grip. Pick up a Powerball and feel the power immediately. Powerball is like a rapidly spinning vortex in your hand; the faster the engine spins, the more inertial resistance it generates, working your arm harder and harder until your muscles are burning and screaming for you to stop. And because it generates pure isometric resistance, Powerball engages almost the entire group of fibres in each muscle that it’s exercising, ensuring that you’ll reach fatigue in a much shorter time frame than with traditional exercise methods (less than 30 seconds in fact, if you really accelerate Powerball’s rotor speed). Put down your dumbbells and take a fresh look at the way you exercise – these small balls really can build arms of steel. Powerballs are similar to a baseball or tennis ball in size and weigh between 300 – 600 grams (0.6 – 1.3 pounds). However, these handheld gyroscopic strengtheners pack a serious punch. Despite their diminutive size, they can generate over 60 times their own weight in isometric resistance to give you incredible muscle pump. Spin Powerball for as little as 1 minute and feel the same muscle pump as you would after a long weights session. The secret of a Powerball is the gyroscopic rotor that is inside every model. The faster this rotor spins, the more resistance you feel. Powerball is the most mobile piece of gym equipment that you will ever own. It would be quite difficult to carry your 25kg dumbbell set around with you wherever you go, however, with Powerball, you can put it in your bag, bring it to work, spin it while you watch TV or while you wait in the car. 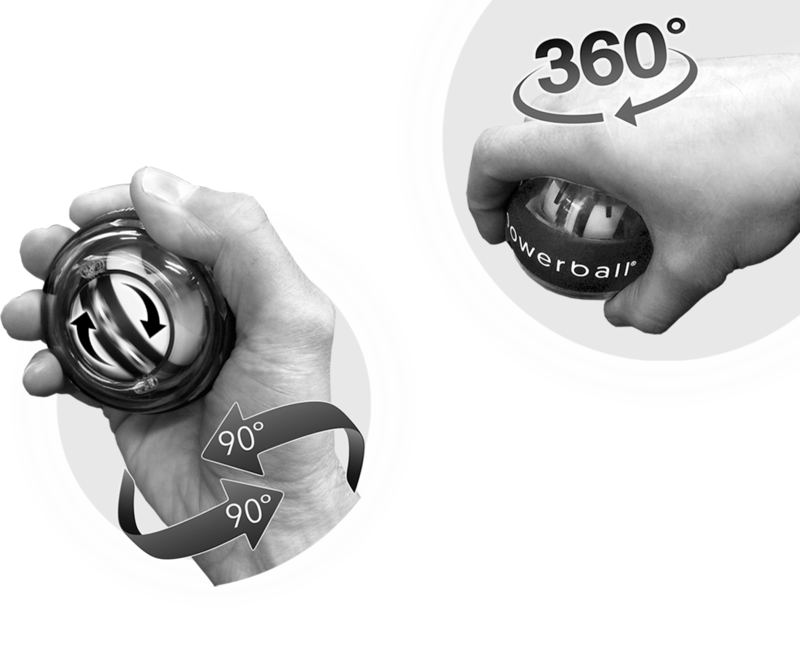 Powerball can replicate the workout of a 25kg dumbbell, all in the palm of your hand. We offer a range of Powerball models to suit everyone’s budget and training goals – check out our store and find the perfect Powerball for you, today. 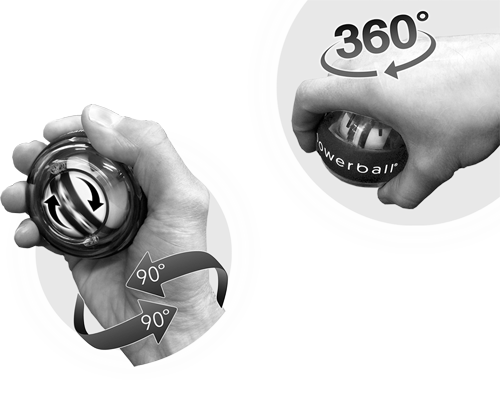 Powerball enables you to target every group of muscles – from your fingertip all the way to your shoulder. Vary the position of your arms and they way you grip Powerball to target specific muscle groups. Check out our guided exercise programmes for more information on individual muscle targeting. You can find our full list of videos and exercise programmes in our videos section. Powerball works like no exercise equipment you’ve ever picked up. 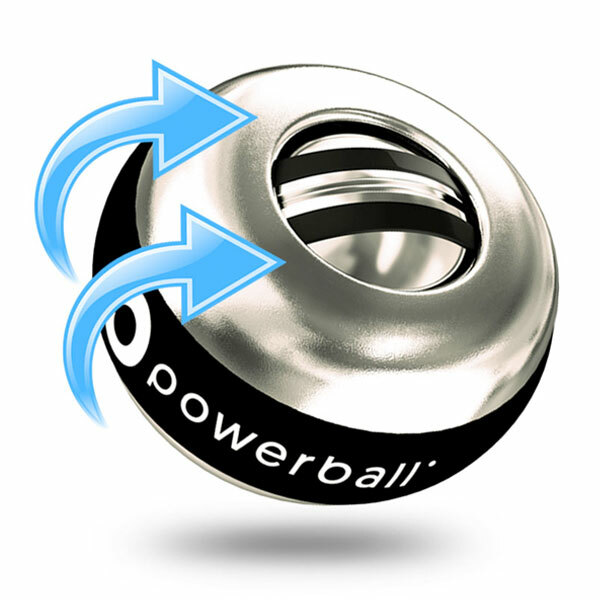 Weighing between 300 – 600 grams, Powerball can generate 60 times its own weight in punishing resistance training.